Day 01: Arrival in Katmandu: Group will be welcomed at the airport by the company representative and transferred to hotel. Day 02: Kathmandu: This day will be disposable for the group whereas official will process the visa formalities in order to get ready for departure for next day. Day 03: Kathmandu-Nepalgunj: An approximate flight duration of one hour group will be landed at Nepalganj airport. After group will be transferred at hotel for overnight stay. Day 04: Nepalgunj-Simikot/Majgaun: Landing at Simikot airport after 50 minutes flight from Nepalganj trek starts hiking towards at an elevation of 3800m after crossing this pass trail descends gradually until reaching at Majgaon also locally known as Tuling 2,700m. The walking span will be approximately 4/5 hours that will allow the chances of few greeneries of wheat and barley fields which is the major crops of this region. It depends upon the physical condition of the guests if they realize for any rest during these days the itinerary is flexible. Day 05: Majgaon/Kermi 2,690m: 6/7hrs trek. The trail follows through Dharapani after breakfast and this day would be little tough. Elsewhere that would be decided by the cook lunch will be served as sometimes it would not be at the fixed place due to unavailability of water on the route. As indicated above after 6/7hrs walking we will reach at the second night camping Kermi. Day 06: Kermi/Yalbang Chaur 2,760m: 6/7 hrs trek. Climbing over a ridge we will walk through a valley having potato and wheat fields, besides this pine forest, many cairns would be other attractions at an approximate height of 2,990m. would be really wonderful experiences of the day. Then route allows trekkers alleviation by going down to the bank of the Chumsa Khola. After crossing this river no choice we should start climbing up with a very steep and rocky escarpment and this day we can say a day several of ups and downs. Ultimately we will descend to the bank of Karnali River, and after short walk we will reach at Yalbang Chaur. Day 07: Yalbang Chaur/Tumkot Khola 2,800m: 6/7 hrs trek. This day we shall be going little bit higher altitude of 2,890m.some villages on the route after passing a main village named Yangar; we go down walking until the trail meets a small unknown river various upwards and downwards should be met with until reaching another camping spot Tumkot Khola. Day 08: Tumkot Khola/Yari 3,450 m 5/6 hrs trek. Another river called Bumachiya Khola comes along the route then another steep that is situated at the height of 3,310m, some mustard fields could be seen after walking through some forests we will reach at a great Jhyakthang Chu Valley stretching out before Yari. This day ends at Yari where camp will be set at the surrounding of Yari an ultimate Police Station is located here for the security of the trekkers. Day 09: Yari/Hilsa/Sher 3500m: 7/8 hrs trek. This day's experience will be different day to a scenery of flat valleys on the way that leads towards Nara Lagna Pass 4580m with a gradual ascending. Then immediately route descends to Ranipuwa which is we can say or consider a real trek of the day until the Humla Karnali River. The continue to walk that will last reaching Hilsa where a stone pillar signifying Nepal/Tibet border then after a short walk we will reach at Sher. Day 10: Hilsa/Sher 3,600m /Taklakot 3,600m: 20 minutes walk from Hilsa to Sher at the moment Jeep will be awaiting there from Tibet side. on the way we will see Kocher Monstery where the prominent famous Sakya Monastery is located there was built in the 6th century. After this we will proceed our drive to Taklakot that takes around 1 and half hour to reach locally Tibetans call this place Purang a place of trading center. A expanding market is situated in the proximity of Karnali River bridge almost all shops are made of mud walls and white canvas roofs. Tibetan wool trade is another famous business of this place and another extension of the sightseeing will be at the 2,890m remains of Simbling Gompa is considered as the biggest monastery and this night will be staying at Taklakot Guest House. Day 11: Taklakot /Lake Manasarovar 4,558m: 95km 4/5 hrs drive. Day starts by driving towards the Lake Mansarovar leaving the route of Manay Tibetan styled settlements, Gurla La pass 4,590m. we also can see other lakes including a big holy lake of Tibet. This night's camp will be set at a wonderful base of the Chiu Gompa. Day 12: Lake Mansarovar/Tirthapuri: 85km. 4/5hrs drive. It would be another exciting day as confronting the yak herding and sheep flocking nomads roving around. They pitched the black tents for overnight stay. Besides this, there would be seen some small rivulets. Day 13: Tirthapuri: Drive to old Bonpo Capital Tschang and Back to Tirthapuri Camp 'Tirthapuri' to Hindus, 'Tetapuri' to Tibetans, is the holy power place of the Hindu Goddess Parvati, the consort of Lord Shiva. It is the power place for the Goddess Bajra Barahi and Tara to the Buddhist. The hot spring here is the main holy sight for the pilgrims and it represents the female element, while Mt. Kailash, the male. 'Tirthapuri' considered the third holiest place in Ngari. This is where Heruka subdued Rudra, and according to Tantrism, this holy place is considered one of the 24 major power places on the sub-continent. It is renowned for its blessing of red and white earth from the hot spring. There is the Dugpa Kagyu Monastery nearby. There is a famous monastery known as Gurem Monastery a medical Lama is residing. Day 14: Toling Gompa 241 Km: overnight at guesthouses tent pitching is not allowed. Tirthpuri 4,330m situated at the west part of part of Tibet of Ali road that turns from Mont-ser Army Camp 11 km to the southern part situated at the bank of Satlej River. A distance of 75 km from Darchen.having hot springs and several meditating caves including famous one is called Guru Rimpoche /Padmasambhav cave. Toling, a remote area is remarkable to this tour and exploring these surroundings overnight stay at guesthouse. Toling 3,780m was the capital of Guge and two main monasteries Khochar and Tabo were built by a renowned king Yeshe O in 996 AD. Day 15: Sightseeing Tirthapuri Day: Drive to Tsaparang Gompa early morning17th century capital was shifted at Tsaparang and Guge Palace built in 10th century and drive back to Toling. Again sightseeing continue in the afternoon to explore Khochar and Tabo monasteries surroundings of Toling and overnight stay at guesthouse. Now it is developing town having shops, restaurants, means of communications, hospitals not like before. Day 16: Toling Gompa/Tsada: Drive to Tsada, citadel on the mountaintop and drive back to overnight camp. Day 17: Tsada/Darchen: Drive to Tarboche (between Tarboche and Chuku Gompa river side) 125km overnight at guesthouse. Day will be counted as hardest one of the tour by crossing of rocky and rockeries trails that ascends to Dolma~La Pass 5,630m. Before crossing this pass there is another important holy place should not be avoided known as Gauri Kunda. After a nice break at the top of the pass we will head down the steep trail to our eventual campsite at Zutulpuk Monastery 4,790m, near the cave of miracles where Milarepa meditated. 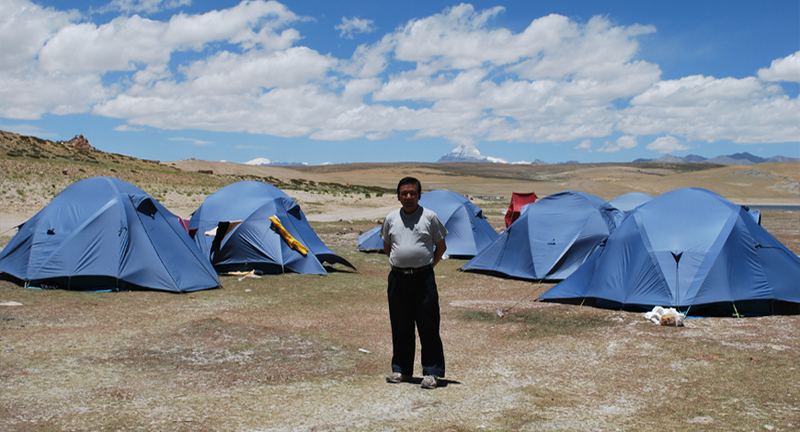 Day 20: Zutulphuk/Darchen 15Km /Mansarovar Lake/Hor Chyu: 45 km 8/9 hrs. Day 21: Hor Chyu/Paryang: 221 km 7/8 hrs. Lake Manasarovar is one of the holiest lakes among others located in the land of Tibet. By following the cosmological concept of Hinduism and Buddhism on four prominent rivers named Brahmaputra, Sutlej, Ganga and Indus it is described the source that is originated with this Lake is proved to be true. You can realized the truth as these rivers starts from this Lake. You can see the astounding face of Mount. Gurula Mandhata 7,728m, Trugo Monastery and Chiu Monastery. We shall drive back to Paryang from Hor Chyu for over night stay. Day 22: Paryang/ Saga: 241km 8/9 hrs. Road crossing with wondrous valleys, several clean watered rivers, amazing yaks and sheep grazing pasturages, nomads, traders tour continues towards Saga. Other part of the attraction can be highlighted with marvelous landscapes, snow-capped mountain peaks, sand dunes, and typical geographical composition in the land of Tibet that make your tour worthwhile enjoying the day which lasts at Saga. Day 23: Saga/Nyalam 241km 8/9 hrs. After breakfast we will leave for Friendship Bridge Nepal/China border from Saga via Nyalam. After brief dealings at the Immigration at the border we proceed for lunch. After lunch we set our out journey for Kathmandu catching a tourist bus following a number of turnings of narrow road on banks of Bhotekoshi. On the route bus passes way through Dolalghat,Dhulikhel, Banepa entering into the valley of Bhaktapur and ultimately arriving in Kathmandu. Unquestionably entire tour completes with dropping guests at hotel. Day 24: Nyalam/Kathmandu: 157km 7/8 hrs. Options on this day has freely left at clients' disposal either choosing for mountain flight or proceed Manakamana Or Muktinath pilgrimage tours. Few capital based flying companies chartering the helicopters for this purpose in an Exclusive charge. Day 25: Drop guests at the airport for final departure check-in further boarding on the aircraft.